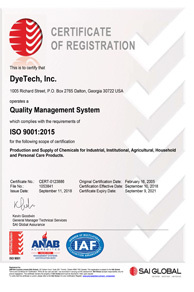 DYETECH INC. is an ISO 9001 registered producer of Specialty Chemicals for the Textile and Carpet Industries as well as Institutional and Personal Care Products. We are located in Dalton, Georgia, the carpet center of the United States, but our reach is world-wide. DyeTech specialty chemicals are used in every field of carpet and textile dyeing and finishing; beginning with fiber extrusion, spinning and weaving, yarn and space dyeing, continuous and batch or beck carpet dyeing, water, oil and soil or stain resistance, and throughout the manufacturing process until the floor covering or fabric is shipped to the mill's customer. DyeTech produces every type of chemical for carpet, textiles and dyeing in our ISO 9001 plant. Carpet and Textile chemistry is DyeTech's business!